Last night, the O’s held a 6-0 lead over the Boston Red Sox, with just 12 outs standing between them and a .500 record in mid-May. Fans of other teams who stumble upon this post may scoff at the use of the .500 barometer as something to strive for, but hey…we’re O’s fans. We’ve been beaten down by 13 straight years of sub-.500 baseball, and at this point it’s really all we hope for. Since falling below .500 for a second time on May 2, then dropping to a season-high 5-games below .500 on May 8, many here in Birdland didn’t expect to see that “hallowed ground” until Opening Day 2012 and 0-0. So when last night, the Birds jumped out to a 6-0 lead over the Red Sux after five innings, we could all just smell .500 – to be honest, it smelled kind of mediocre, but that’s neither here nor there. It’s good enough for us! Unfortunately, starter Chris Tillman’s back stiffened up after five shutout – shaky, but shutout nonetheless – innings, and Buck was forced to turn things over to the bullpen. Or, as I’ve taken to calling them, the buLOLpen. Of the six (!) 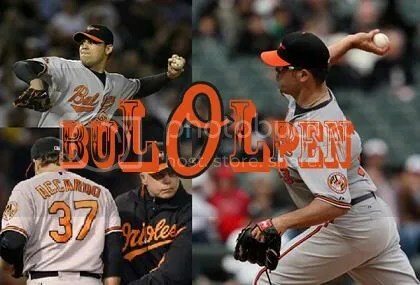 relievers the O’s called upon over the game’s final 3 1/3 innings, four of them gave up at least one run. Six pitchers. Ten outs. Ten hits. Eight runs. Though the O’s managed to “hold off” the Sux in the sixth, seventh, and eighth innings, never allowing the game to become tied, O’s fans everywhere knew that there was only one way this game could end. With a Kevin Gregg blown save. Which is, of course, exactly what happened. Adding insult to injury, it happened in the most Kevin Gregg-esque of ways as well. After retiring leadoff hitter Jason Varitek (on a fly ball to the warning track, no less), Gregg proceeded to walk each of the next two batters, the fastest guys on the team not named Crawford. Following those free passes to Jacoby Ellsbury and Dustin Pedroia, Adrian Gonzalez smacked one off the ‘monstah and that was all she wrote. Add another to list of late-inning collapses against the Red Sox, and the O’s are now – again – a small winning streak away from that .500 milestone. De facto ace Zach Britton takes the hill tonight against Tim Wakefield to try to get said winning streak underway. This entry was posted on May 17, 2011 at 8:59 am and is filed under Orioles. You can follow any responses to this entry through the RSS 2.0 feed. You can skip to the end and leave a response. Pinging is currently not allowed.